How Do I Apply For An Annuity Policy? Will the life annuity be a single life or joint life? Will the life annuity be for yourself or will it include your spouse? Will there be a guarantee period? You have the option of choosing no guarantee on your life annuity or you can choose the most common 10 year guarantee. In most cases the longer the guarantee the lower the annuity income. The guarantee period for registered life annuities is to age 90. For example if your current age is 65, your maximum guarantee can be 25 years. Would you like to receive your life annuity income, monthly or annually? When would you like to purchase the annuity and when would you like to start receiving the income payments? Usually purchase date and income start dates are the 1st and 15th of each month. Are the funds registered or non-registered? Are registered or non-registered funds to be used in the purchase of this life annuity? 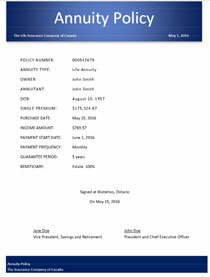 In order to get the best possible income you need to compare quotes from all the life insurance companies in Canada. You can shop the market by completing our Life Annuity Quotation Survey. After you decided on the insurance company, request a rate guarantee to lock-in the rate. The insurance company will then issue your life annuity policy. Because we are independent we do not promote any particular insurance company. You choose the company you want, which is usually the company offering you the best annuity income.